The hull of the offshore construction and well intervention vessel “Polar Onyx”, built by the order from Norwegian company Ulstein Hull AS, has been launched at Shipyard Zaliv on May 31, 2013. The hull is currently moored alongside the outfitting berth of the Ukraine-based yard and is waiting to be towed to Norway to the place of final completion. The high-capacity vessel is designed for operations in harsh conditions and deep waters, with a length of 130 meters and a 25 meter beam. The vessel is built to the highest standard for dynamic positioning, DP2+, and is equipped with a 250t AHC offshore crane. It is also equipped with a 275t Vertical Lay System above a moonpool which is capable of installing flexible pipe and umbilicals to 3,000m water depth. The vessel has recently been chartered to Ceona Services (UK) for a period of 5 years and it will start working for Ceona immediately upon delivery from Ulstein Verft in the first quarter of 2014. In total, during the six years of cooperation between Zaliv and Ulstein Hull AS, fourteen vessels have been built for work in the oil and gas industry. 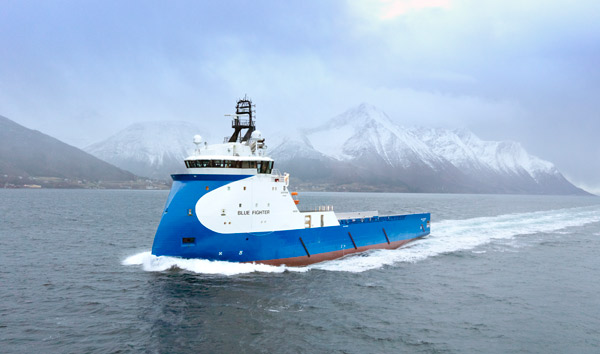 Ulstein Group, a group of companies mainly known for its ship building and ship design activities reported today that the first platform supply vessel (PSV) newbuilding of the PX121 design from ULSTEIN®, M/V Blue Fighter, was named in a formal ceremony at Ulstein Verft, Norway on 12 January. The vessel, 83.4 m of overall length, is the first of two PSVs of the new design under construction at Ulstein Verft for Blue Ship Invest, a shipping company in ULSTEIN. 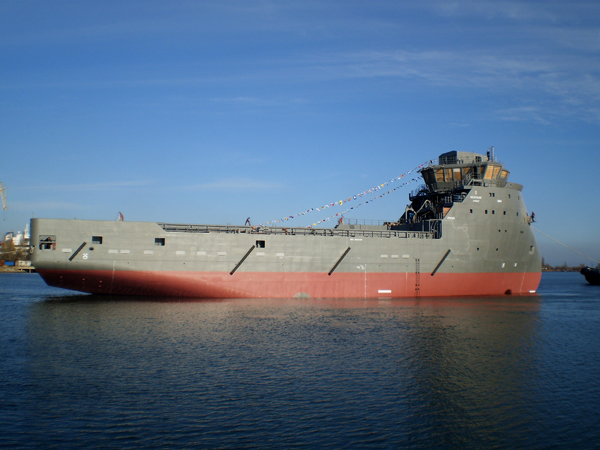 Blue Fighter’s sister vessel will be delivered in Q3 of 2012. 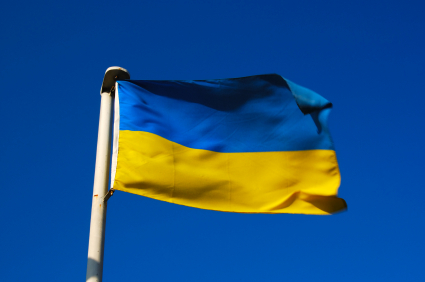 Ukraine has postponed the construction of a liquefied natural gas terminal due to a lack of funding, Ukrainian newspaper Kommersant Ukraine has reported. The project, undertaken by national gas company Naftogaz Ukrainy, is planned to be constructed on the Black Sea. However, due to a lack of investor interest, the project has been delayed, the paper reports a source from Naftogaz Ukrainy as saying. The country will now concentrate on a cheaper low-power floating regasification plant, the paper says. The country is now considering the possibility of renting a floating terminal for regasification of the LNG until funding can be secured to built a terminal of its own. Ukraine has turned to alternative sources of gas as part of an effort to diversify supply from Russian supplier Gazprom. Spanish Socoin, a gas engineering company, has recently been tasked with completing a feasibility study on the LNG terminal. The hull for yno 294 at Ulstein Verft, a platform supply vessel of design type ULSTEIN PX121 for Blue Ship Invest, was launched by Zaliv shipyard in Ukraine on 30. November. “This hull is hull number 500 from Zaliv, and this special occasion was celebrated with a great many invited persons”, comments project manager Per Svein Brekke from ULSTEIN. He was present along with the ship owner representative Odd Nordam and ULSTEIN´s site team in Ukraine, which consists of Magnar Kvamme, Anders Sundgot, Paul Myrvågnes, Igor Kogan, Yuriy Stoyev and Yuliya Sydorova. Tow starts around mid-December, and is expected to arrive Ulstein Verft in January. The ship is scheduled for delivery in the third quarter of 2012. JSC Shipyard Zaliv completed works over next shipbuilding order for Norwegian holding Ulstein Hull AS. The seismic research vessel project SX 134 became the sixth built by Zaliv by order of this company. 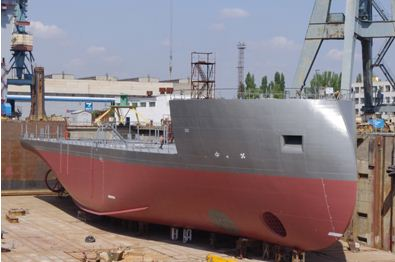 Kerch shipbuilders commenced works over this vessel in February current year, and the vessel laying in the dry dock occurred on May 10 and on July 27 the vessel was solemnly launched from the dock. The hull delivery occurred with strict keeping of contractual terms and the quality of works execution have been evaluated by the company inspectors to be high. At the present moment Zaliv continues construction over three more shipbuilding projects also ordered by holding Ulstein. It is scheduled that until the end of 2011 works over two of them shall be completed.